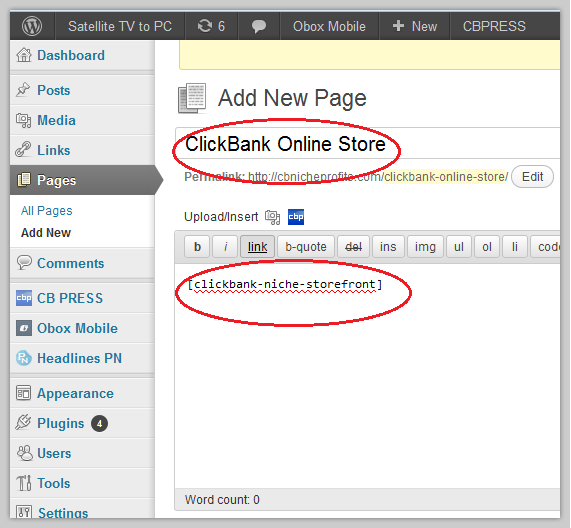 Host & Run Clickbank Niche Storefront on your server. 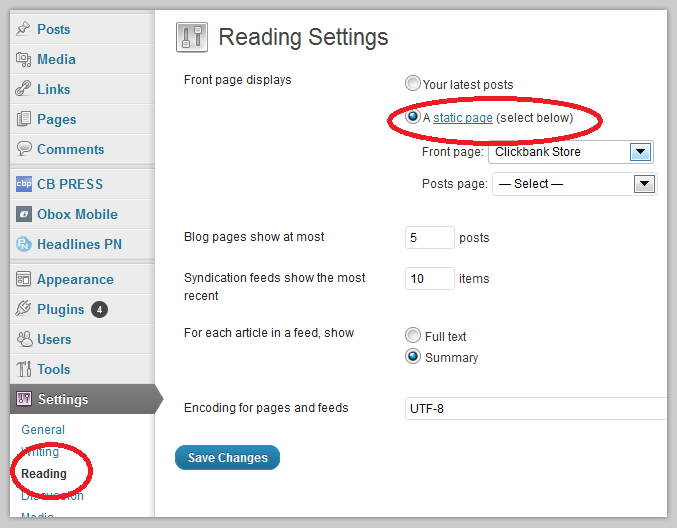 Install to your WordPress blog with just few clicks. Easily integrates with your existing Wordpress theme. Complete control over customization. 100% SEO friendly. More than 75 PREMADE niche storefronts to choose from as a bundle. The product title and product descriptions we display on your plugins are redefined for leveraged performance. Please click here to see the difference between a normal raw Clickbank ad and a CbproADS redefined ad. .
Wordpress is indeed one of best content management systems that you can use to build an effective website. When you use these services as Wordpress Plugins, you can easily install and host the storefronts on your very own server, with a few simple clicks. This is indeed the best option, if you wish to promote your CB storefronts through Search Engine Optimization. Wordpress offers great flexibility, and you can design your storefront as you please, as this plugin integrates into the system almost seamlessly. You host & run the storefront completely on your server. You own a storefront but virtually. The site is owned by us and shared by many of our affiliate members using their affiliate ID embedding on the url. You must own a domain name as you host the site with your preferred hosting provider and you have the complete control over source files and your storefront. You can promote the storefront on your domain name by using domain forwarding option from your domain registar's control panel. This is optional. You can promote through the URL given by us also. You should have a fair knowledge in WordPress installation and some other technical things to some extent. This is pre configured. No need of techinical knowledge required. You can directly promote the storefront url which is give by us. You have little options when you are really serious about promoting through SEO. You can add your own logo, content/article, header, Google ads/widgets or other HTML snippets to it. It is highly customizable. Yes, we also provide customization to some extend but not much as WordPress provides. To download the READY-MADE NICHES (around 100+ readymade niches), please login to your members area and download it from there. These READY-MADE niche storefronts are made by a third party provider, while it comes to you absoultely free of cost as a CBproAds member. Each READY-MADE niche storefront comes along with a WordPress installation files, theme, necessary plugins, few articles,videos,affiliate ads etc.... You may install our raw WP plugin for niche storefronts to the READY-MADE package so as to make it a complete niche storefront. 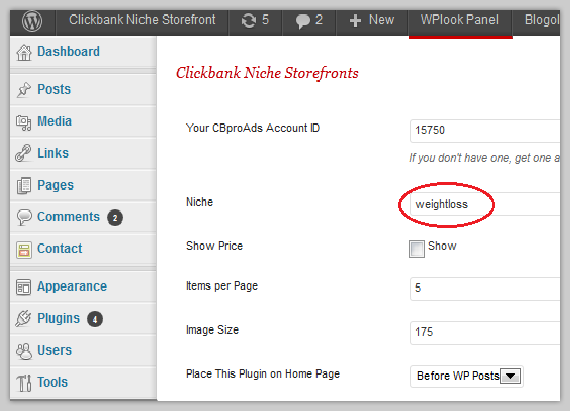 You can install niche storefront on to your existing WP blog or to the bundle package mentioned above, using this raw niche storefront plugin. Download and upload the zip file using the upload form of your wordpress admin control panel. on how to install WP plugins, if you have any doubts. 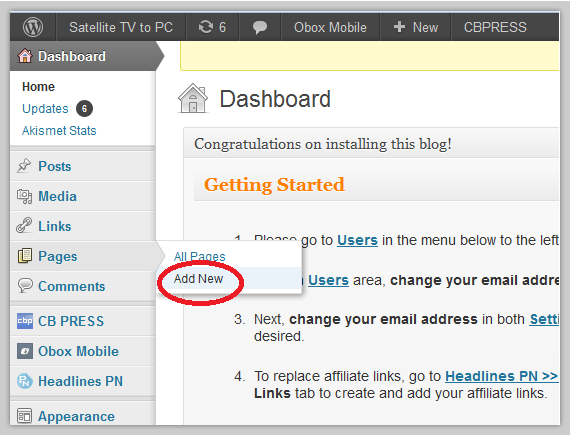 After the activation of plugin, you may click on settings link of the plugin as shown in below picture. After this, you have to replace 15750 with your CBproAds userid as shown in below picture. Now enter the niche code as shown in below picture. Please see the table below to find the niche code of your desired niche. In case if you have chosen for Don't Add option from the Place This Plugin On Home Page option box, and would like to show the niche storefront products on a separate page, you may follow the steps shown below. Create a new page and label as you wish. 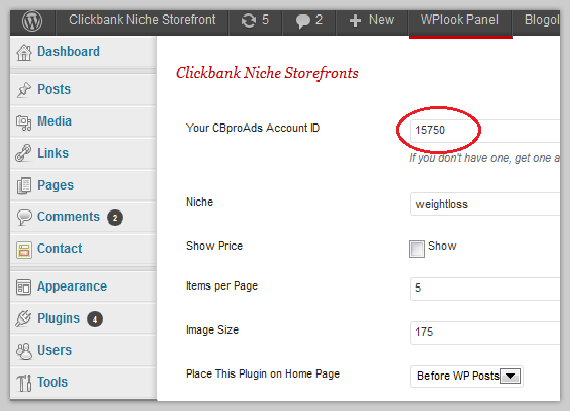 Insert the shortcode [clickbank-niche-storefront] on to it as the page content. Why CBproAds.com WordPress Plugin is the best for CB Storefronts compared to other vendors? We are only plugin provider that offers redefined title & descriptions in plugin storefront. Others use Clickbank's raw data(XML feed data) simply which is framed meant only for Clickbank'a affiliates. It is not informative to potential buyers. 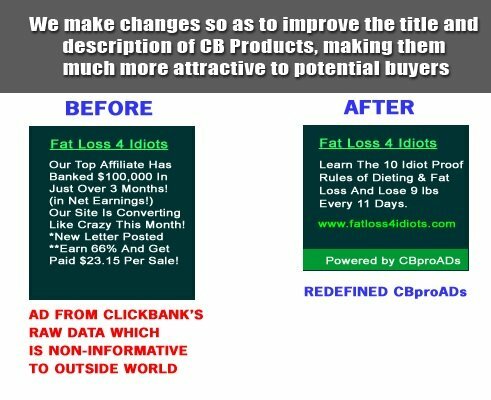 Clickbank.com often changes it's marketplace data XML feed structure. With our plugin, your storefront is never distutrbed. Our Plugin pulls the data from our centralized XML feed rather than from clickbank's raw XML feed. We make sure that when ever a change is made by Clickbank, our centralized XML feed is too updated according to that structure. Other vendors simply imports XML feed to your server and you are accessing the data from your server only. You have to wait for that vendor's plugin update; whenever Clickbank XML feed structure is changed. After the installation, you don't have to update your marketplace feed data every day with Clickbank's data. As you share our centralized XML data feed, we only need to update with Clickbank's data feed everyday and it will get reflected on your plugins automatically. In short, there is no further maintenance needed with our plugin. 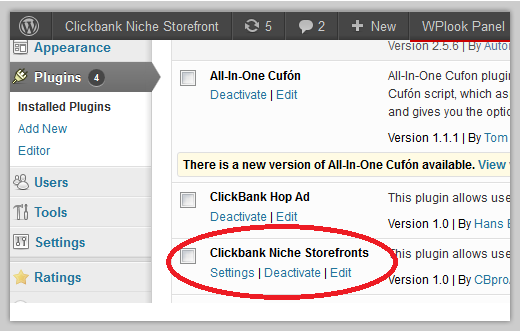 In other plugins, you are required to update your data with clickbank's data feed often daily/weekly. Yes, you have to do the maintenance by your self. We are the only site that provides price of each product in the storefront. We are the only site that provides pre-built WordPress themes along with each niche storefront. Some vendor's settings are really difficult to follow. Integrates with any WordPress theme easily and matches with its color settings.